The Summer King is missing; the Dark Court is bleeding; and a stranger walks the streets of Huntsdale, his presence signifying the deaths of powerful fey. Aislinn tends to the Summer Court, searching for her absent king and yearning for Seth. Torn between his new queen and his old love, Keenan works from afar to strengthen his court against the coming war. Donia longs for fiery passion even as she coolly readies the Winter Court for battle. And Seth, sworn brother of the Dark King and heir to the High Queen, is about to make a mistake that could cost his life. I have been a faithful reader since the first book was published, and I will be sad to see the series end, I am hoping that everything turns out the way I want it, but I can't wait to see how Melissa concludes this amazing series. 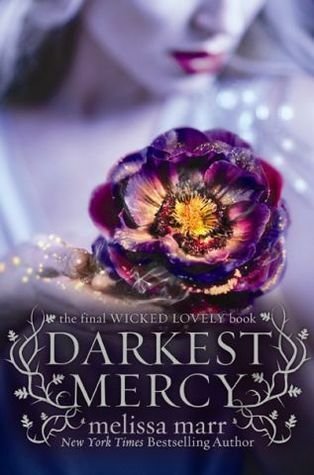 Check out the book trailer for Darkest Mercy . I loved the first book in the series and loathed the second, so I didn't keep reading...but I hope you enjoy this last one! That cover art is gorgeous, at any rate. Happy reading!